Contains an assortment of Salted Large Cashews, Milk Chocolate Cashews, Yogurt Cashews, Honey Roasted cashews, Butter Toffee Cashews and Dark Chocolate Covered Cashews. I am SO glad that I purchased this assortment tray because it allowed me to sample the different types of cashews available - without having to purchase large quantities. Now I know what I will - and will not - be ordering in the future. 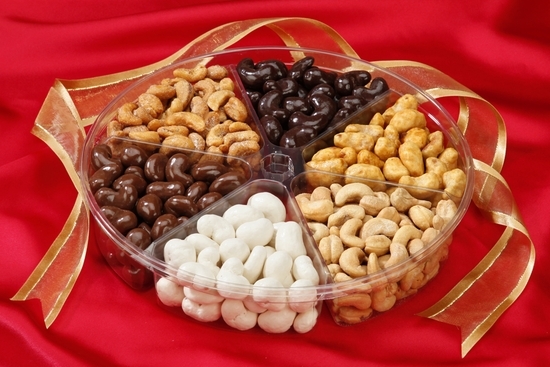 The variety of cashews. The tray itself: Good for gift-giving AND keeping. The coating on the butter toffee cashews is VERY hard (a possible tooth-breaker) and leaves an unpleasant after-taste.